Boynton Beach is a city in Palm Beach County, Florida, United States. The population was 68,217 at the 2010 census. In 2006, the city had a population of 66,714 according to the University of Florida, Bureau of Economic and Business Research. 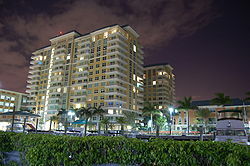 Boynton Beach is a principal city of the Miami-Fort Lauderdale-West Palm Beach, Florida Metropolitan Statistical Area, which had a 2006 estimated population of 5,463,857. Boynton Beach was originally founded on September 26, 1898 when Byrd Spilman Dewey and her husband Fred S. Dewey filed the original plat in theDade County courthouse for the Town of Boynton. The town was incorporated in 1920 as the Town of Boynton. The name “Boynton Beach” was first used by a community that broke off from the Town of Boynton in 1931. In 1939 that community changed its name to “Ocean Ridge” while The Town of Boynton took the name “Boynton Beach” in 1941.